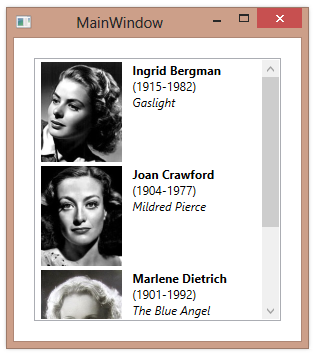 By default, the visibility of both horizontal and vertical scrollbars for a ListBox is set to Auto, indicating that the scrollbars should show up automatically, as needed. 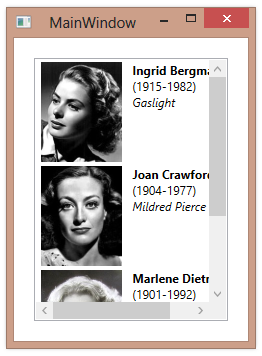 Scrolling in a ListBox is managed by a ScrollViewer, which contains the items panel of the ListBox. 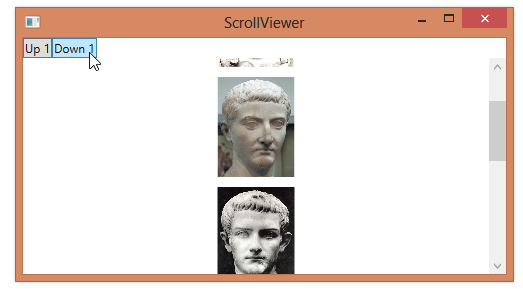 The ScrollViewer provides scrolling logic and makes available both a horizontal and a vertical scrollbar. The visibility of the scrollbars in a ScrollViewer is controlled by the HorizontalScrollBarVisibility and VerticalScrollBarVisibility properties. By default, both of these properties are set to Auto for the ScrollViewer used in a ListBox. 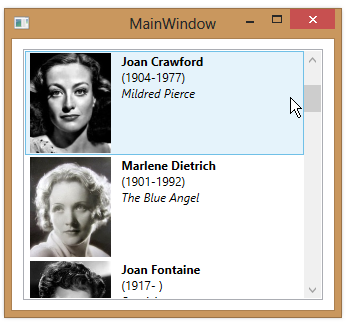 This means that the scrollbar only appears if the content of the ListBox does not fit in the associated dimension. By default, the ListBox control scrolls intelligently, one item at a time. 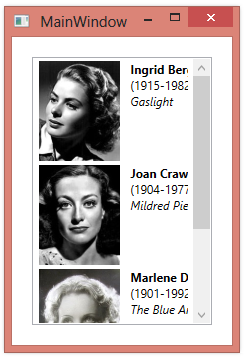 Scrolling behavior in a ListBox is provided by a ScrollViewer. 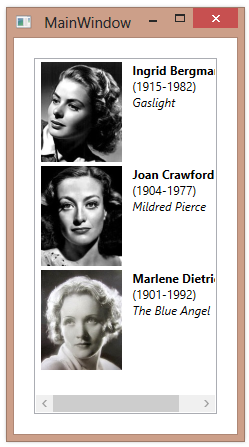 By default, the CanContentScroll property of the containing ScrollViewer is set to true, indicating that the items panel (e.g. a StackPanel) is responsible for the scrolling. 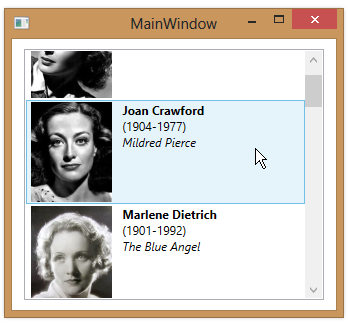 The StackPanel scrolls one item at a time as you drag the scrollbar thumb. If you want to allow scrolling by pixels, rather than by items, you can set the ScrollViewer.CanContentScroll property on the ListBox to false. This delegates scrolling responsibility back to the ScrollViewer. 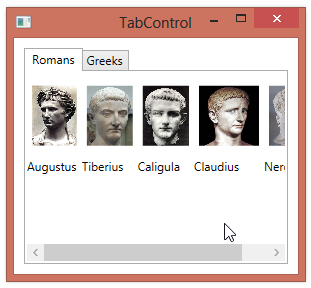 You can scroll content within a given tab of a TabControl by placing the content of each tab into a ScrollViewer. In the example below, the first tab contains a ScrollViewer, which in turns contains a Grid containing the tab’s content. 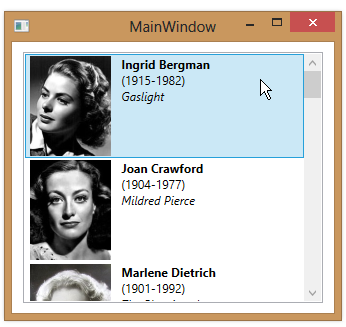 If you have a particular control contained within a ScrollViewer and you want to programmatically scroll to that control, you can use its BringIntoView method. 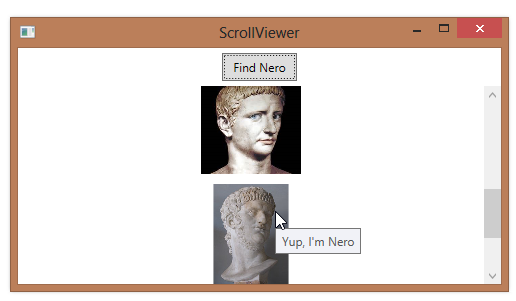 For example, when we click the “Find Nero” in the sample below, we’ll scroll the image of Nero into view. <Image Name="imgNero" Source="Nero.jpg" Height="100" Margin="5"